Hokto mushrooms are grown, harvested, packaged, and shipped under the strict control of our Quality Assurance and Food Safety Program. With complete control over the culture technology and production management, Hokto mushrooms deliver unparalleled consistency, quality, taste and most importantly, food safety. Hokto Kinoko mushrooms are free of chemicals and additives! Our mushrooms are grown in 100% organic culture materials, and are completely free of any additives or chemical compounds. Hokto Kinoko mushrooms are all pure and natural. Additionally, our mushrooms contain none of the agrichemical ingredients listed below. A preservative is a chemical substance that is added to food, beverages, and many other products to keep it fresher longer. Preservatives prevent decay and decomposition, also protecting the food against discoloration and spoilage. There are no preservatives in Hokto Kinoko products. Chemicals can end up in food – either intentionally for a technological purpose (e.g. food additives), or through environmental pollution of the air, water or soil. Chemicals in food are a worldwide health concern and are a leading cause of trade obstacles. Because of inherent limitations of science, the US Food and Drug Administration can never be absolutely certain of the absence of any risk from the use of any chemical substance. 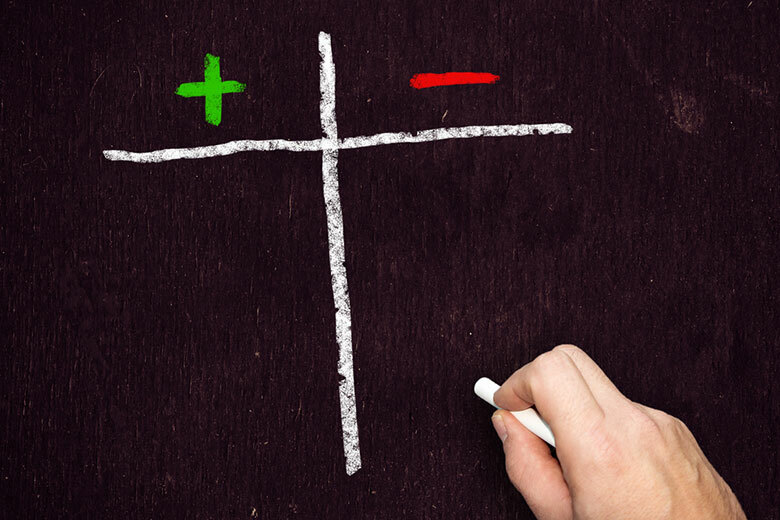 Therefore, the FDA must determine – based on the best science available – if there is a reasonable certainty of no harm to consumers when an additive is used as proposed. In fact, the FDA maintains a data base of more than 3,000 ingredients used in the US food supply. 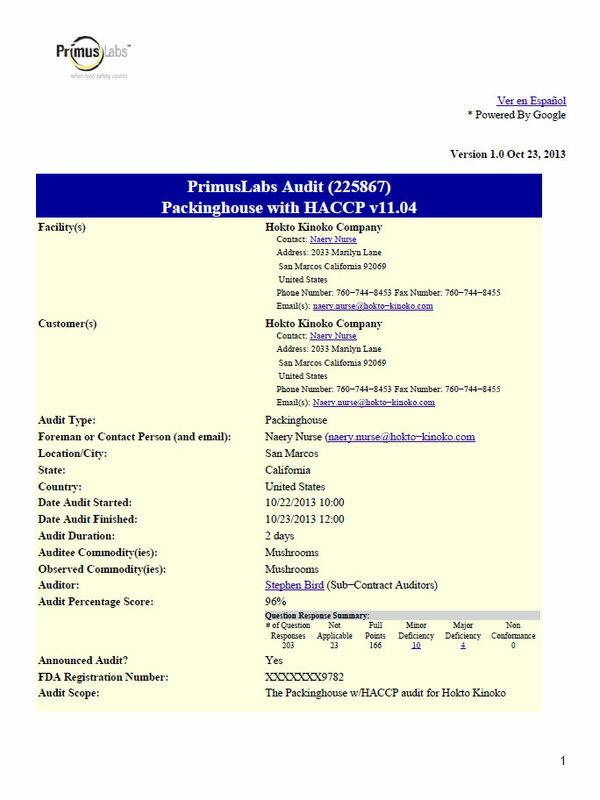 An article from bebrainfit.com suggests that various combinations of these common food additives appears to have a neurotoxic effect (harms the brain)—pointing to the important fact that while low levels of individual food additives may be regarded as safe for human consumption, we must also consider the combined effects of the vast array of food additives that are now prevalent in our food supply. Some of these food additives and preservatives allowed by FDA may even raise risks for cancer and heart disease. We at Hokto add absolutely no chemical additives to our Kinoko or to the growning media. Our Kinoko are pure and natural and 100% mushroom. Aged manure is often used as fertilizer for farming operations. Manure is animal feces used for fertilizing land, as it can contribute to soil fertility by adding nutrients such as nitrogen, which are trapped by bacteria in the feces and transferred to the soil. Manure and compost not only supply many nutrients for crop production, including micronutrients, but they can also serve as valuable sources of organic matter. Increasing organic matter in soil improves structure of soil. But growth-promoting hormones can pass through cattle to their manure. Some scientists are increasingly concerned about the environmental impacts of this hormone residue as it leaks from manure into the environment, contaminating soil, and surface and groundwater. Bovine feces may also have residual rBGH and other growth hormones. References: GRACE Communications Foundation – Hormones / National Center for Biotechnology Information, U.S. National Library of Medicine – Heavy metals pollution in poultry and livestock feeds and manures under intensive farming in Jiangsu Province, China. We at Hokto never use any manure. Herbicides are chemicals used to control unwanted plant growth, such as weeds. The term organic herbicide has come to mean herbicides intended for organic farming. Some herbicide are poisonous, and long term use can damage both the Earth and its inhabitants. Herbicidal drift happens regularly, and given the volatility of many herbicide ingredients, it can move to a non-target area and cause untold damage. We at Hokto never use any herbicides. Fumigants are volatile, poisonous substances sprayed on farms to kill insects, nematodes, rats, weeds, pathogens, and other organisms that damage crops. Because these substances may kill other soil organisms that ordinarily control nematodes by predation or infection, serious nematode infestations may follow fumigation. We at Hokto never use any fumigants. Pesticides are toxins, and have been linked to a number of health problems, including neurologic and endocrine (hormone) system disorders, birth defects, cancer, and other diseases. Although it is widely understood that exposure to pesticides is dangerous to humans, the Center for Disease Control and Prevention (CDC) has released data showing a high percentage of individuals that were tested had certain pesticides or the chemical breakdown of those pesticides (metabolites) in their blood and/or urine. CDC research also shows that people in the US carry levels of pesticides in their bodies that in some cases exceed the EPA’s acceptable levels. While pesticides were originally developed to protect crops by destroying threats to those crops, the fact is that farm animals, wildlife, and humans can become ill or dies after exposure to even a small amount of a pesticide. We at Hokto never use any pesticides. Chemical fertilizers are synthetic compounds that have been refined to extract nutrients and bind them to other chemical fillers in order to promote better, faster plant growth. Many artificial fertilizers contain acids, such as sulfuric acid and hydrochloric acid, which tend to increase the acidity of the soil, reduce the soil’s beneficial organism population, and interfere with plant growth. Generally, healthy soil contains enough nitrogen-fixing bacteria to satisfy the needs of growing plants. However, continued use of chemical fertilizer may destroy these nitrogen-fixing bacteria and change the soil’s pH, resulting in a toxic buildup of chemicals such as arsenic, cadmium, and uranium. Bacterial disease resulting from the lack of trace elements in soil regularly dosed with chemical fertilizers is not uncommon. We at Hokto never use any pesticides in the growth of our pure, natural, delicious Kinoko. We are certified with Good Manufacturing Practices (GMP), the SQF Program (SQF), Hazardous Analysis and Critical Control Point program (HACCP), and comply with Mushroom Good Agricultural Practice (MGAP) guidelines. 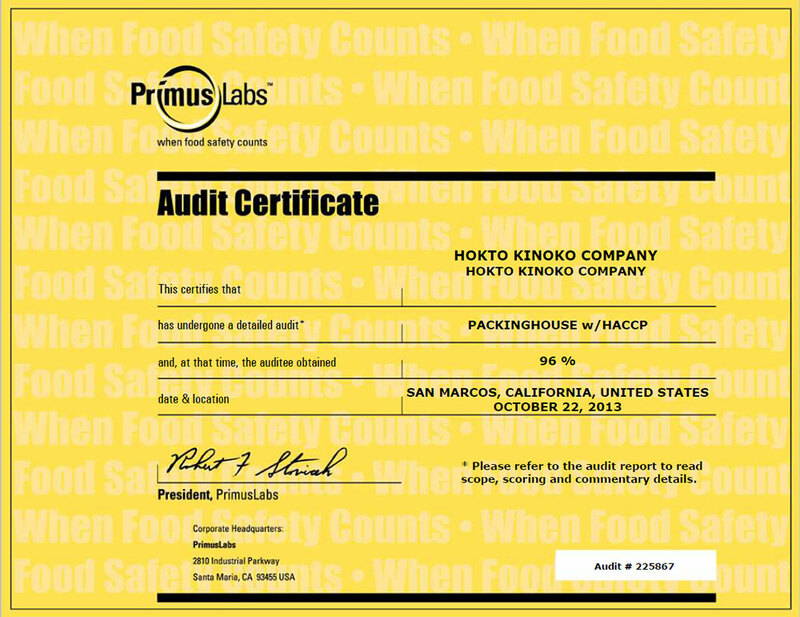 Hokto employs apply a Hazardous Analysis and Critical Control Point (HACCP) program. 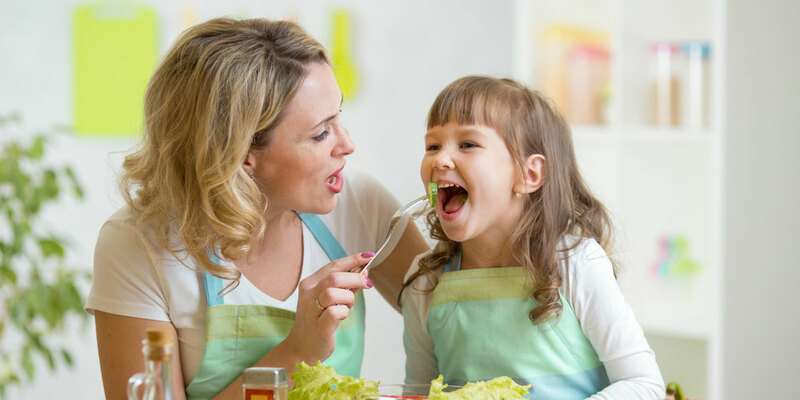 This is a formalized, written plan that defines the exact procedures we follow for maintaining control of potentially hazardous food at the critical control points of food preparation or processing. 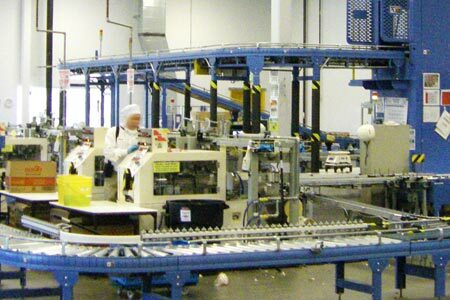 This management system insures that food safety is directly addressed through the analysis and control of biological, chemical, and physical hazards that can result from raw material production, procurement, and handling. The process extends all the way through to our manufacturing and distribution of finished products. We are also certified in the SQF Program which is recognized by the Global Food Safety Initiative (GFSI) and links the primary production certification to food manufacturing, distribution and agent/broker management certification. Good manufacturing practice (GMP) is the aspect of quality assurance that warrants that all products are consistently created and controlled at the proper level of quality standards as required by regulatory agencies for that region, and also appropriate for their intended use. 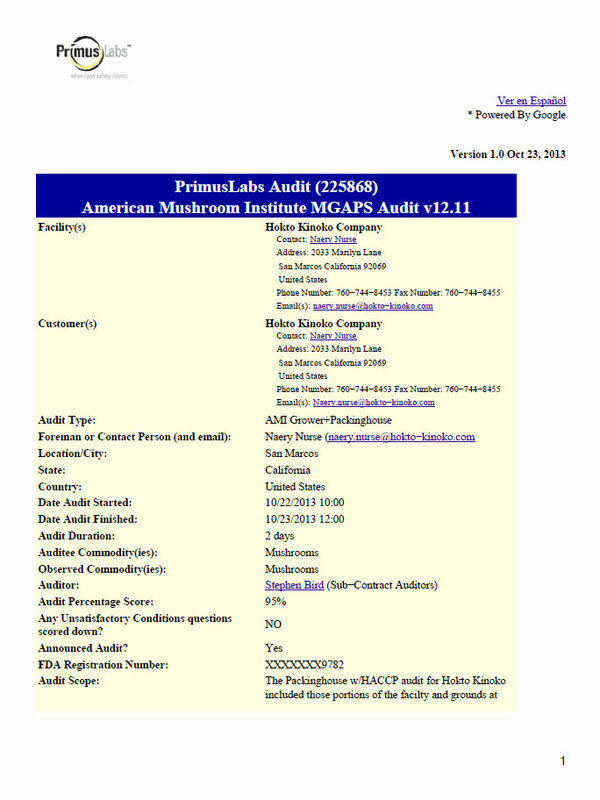 In the United States, it is mandatory to follow all GMP standards; this is enforced by the Food and Drug Administration (FDA). Mushroom Good Agricultural Practices (MGAP) – the industry-wide food safety standards and procedures set for growing, harvesting, and shipping fresh mushrooms – are used by growers to improve and document safe mushroom growing practices. 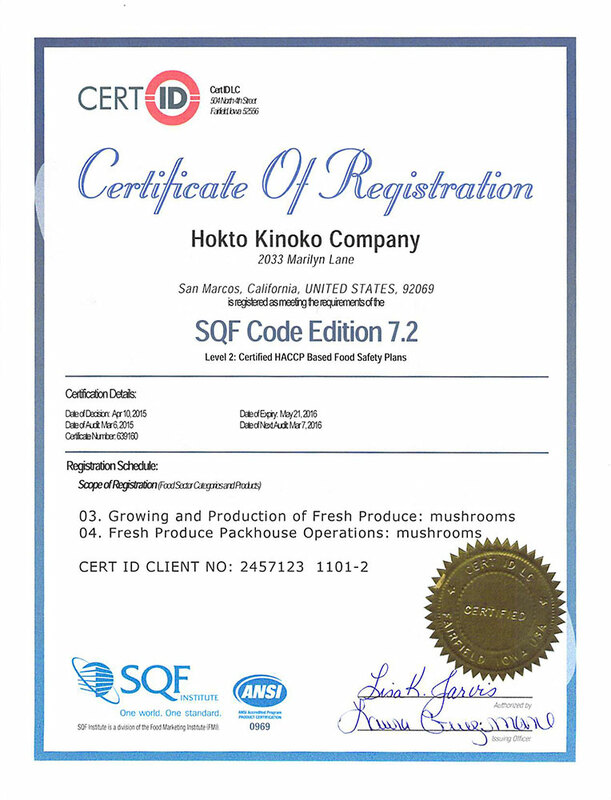 Hokto makes rigourous effort to keep the facilities in best condition, to keep producing best mushrooms. 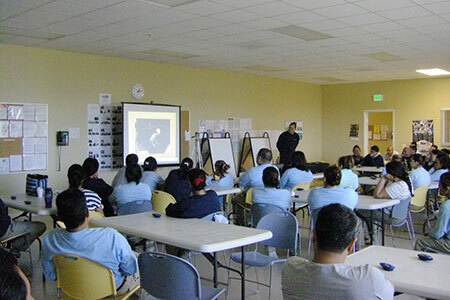 Employee training program to improve awareness and knowledge on food safety. What does Hokto make different from other brands?